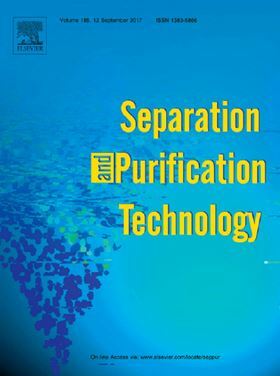 The research article 'Pilot scale recovery of lignin from black liquor and advanced characterization of the final product' has been published in Elsevier journal Separation and Purification Technology (Volume 221, 15 August 2019, Pages 226-235). Recently, the academic and industrial interest in lignin as a renewable resource for many valuable applications has been on the rise. However, the current biomass separation technologies are focused on obtaining high quality cellulose which can be further processed, e.g., in the paper industry, resulting in a lignin of rather low quality. Moreover, lignin recovery from black liquor is often accompanied with filter clogging and a severe flux decline, limiting the cost-efficiency of its valorization. In this work, the pilot scale recovery of lignin from a black liquor derived from a mild soda pulping process of Miscanthus x giganteus chips is studied with the aim to develop a straightforward procedure that yields a high quality final product. A first pilot scale experiment demonstrated the pH to be crucial for optimal precipitation. Moreover, adding an enzyme mixture containing cellulases, hemicellulases and β-glucosidases, clearly enhanced the flocculation and filterability. Thorough characterization of the obtained lignin showed a native-like structure which can be related to the mild pulping conditions and revealed that the p-coumarates and ferulates were converted to the free acids as a result of the base catalyzed hydrolysis as well as the enzymatic cleavage of the ester linkages leading to the complete removal of the hydrophilic (poly)saccharides. Moreover, this resulted in a slightly more hydrophobic lignin material that was more amenable to flocculation. Building on lab scale experiments aimed at optimization of the process conditions, a second pilot scale experiment was performed resulting in improved precipitation and flocculation by means of acidification, an enzymatic treatment as well as the addition of a flocculant. This allowed for smooth filtration and resulted in a high purity of the isolated lignin.